Though interesting in theory, the 1980s resurrection of The Twilight Zone is three seasons' worth of spotty television, with just as many winners (the Bruce Willis-led "Shatterday," for instance) as there were ill-advised misfires (the cheesy remake of the O.G. Twilight Zone's classic "The After Hours"). And then there's "Nightcrawlers," a visceral and oppressively bleak sneak attack directed by the great William Friedkin (The Exorcist, The French Connection). "Nightcrawlers" hints at what Friedkin would later convey in his 2006 feature film Bug—world-crushing paranoia. 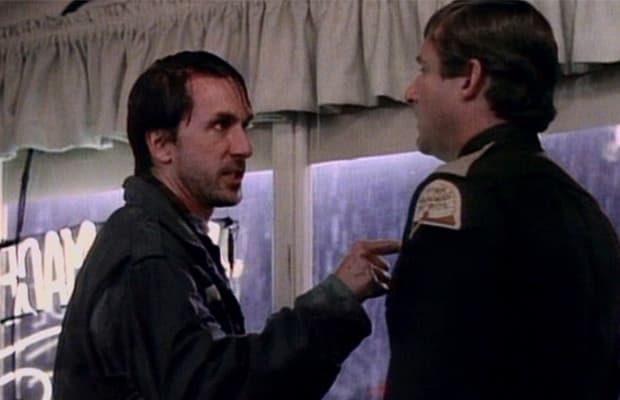 Its central character is Price (Scott Paulin), a neurotic Vietnam vet frantically telling people inside a roadside diner about how the ghosts of his former unit, "The Nightcrawlers," are after him. He and his comrades were "sprayed" with some kind of substance that allowed them to make things appear with their mind, like the T-bone steak Price wishes onto the diner's grill. "Nightcrawlers" isn't one of those sentimental, moral-driven Twilight Zone episodes—it's a violent, waking nightmare, one that culminates with a wild finale in which Price's "Nightcrawlers" prove their validity in massacre fashion.